Poll: Is the 24/7 Financial News Cycle More Signal or Noise? Is the 24/7 financial news cycle more signal or noise? 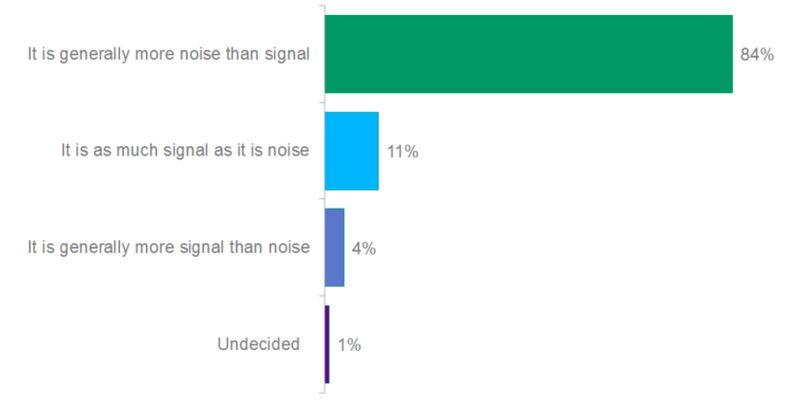 When we addressed this question to CFA Institute Financial NewsBrief readers, an overwhelming 84% of 847 respondents voted that it is generally more noise than signal. The poll results read as an indictment of nonstop financial news. There is no denying that 24/7 news is generally offered by competing for-profit corporations, and the news cycle has been criticized, not unlike junk food, for trying to exploit our behavioral weaknesses. Is the 24/7 financial news cycle more signal or noise? Writing about news and investing in his 2005 book Fooled by Randomness, Nassim Taleb said, “The problem with information is not that it is diverting and generally useless, but that it is toxic. . . . If there is anything better than noise in the mass of ‘urgent’ news pounding us, it would be like a needle in a haystack. . . . It takes a huge investment in introspection to learn that thirty or more hours spent ‘studying’ the news last month neither had any predictive ability . . . nor did it impact your current knowledge of the world.” Beware the avid followers of financial news! Do you want to participate in future polls? Sign up for the CFA Institute Financial NewsBrief.